Terrys Fabrics has a wonderful range of the latest fabrics and textiles. The range includes great discount deals on interior designs, curtains, blinds, wall art, ready made curtains, rugs, lights, tieback and everything you need for the perfect look in your home. Check out the clearance section on TerrysFabrics.co.uk and you can save 50% off select clearance bedding. Act now and you can save up to 75% off designer fabrics from TerrysFabrics.co.uk. Reflect on this! TerrysFabrics.co.uk is now offering 25% off select mirrors. 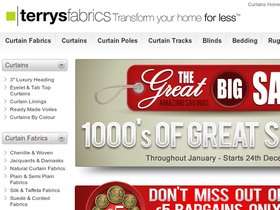 Act now and you can save up to 35% off ready-made curtains from TerrysFabrics.co.uk. Buy more, Save more! Right now when you buy 2 pictures from TerrysFabrics.co.uk, you'll save an extra 10% off. Use this voucher code to save 15% on your Kylie Bedding purchase from Terryfabrics.com. Free Shipping on Made to Measure Blinds. Act now to receive a 40% discount on your custom Wooden blind order from Terryfabrics.co.uk. Click link for details.